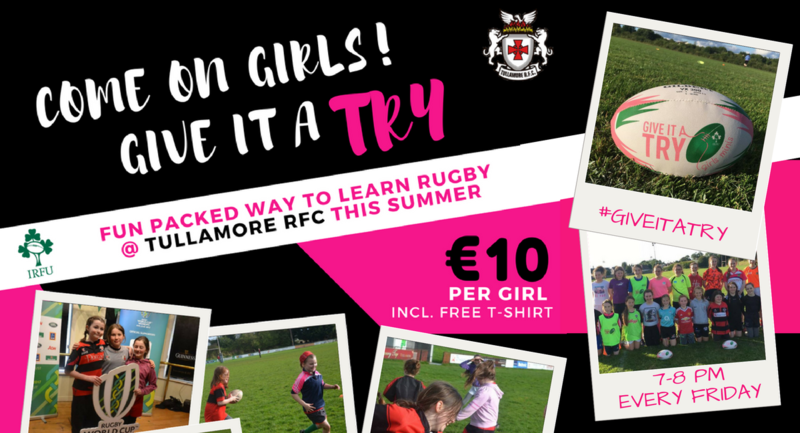 Girls of Tullamore, Geashill, Daingean, Killeigh, Kilbeggan, Mucklagh and beyond, if you (or your daughter, sister, neighbour or niece) are between the ages of 9 - 15 and want to give rugby a TRY, well now's your chance! With the Women's Rugby World Cup taking place in Ireland this summer, the excitement and buzz surrounding the tournament is beginning to gather momentum. There's even the possibility of local Tullamore player Nichola Fryday being included in the Irish squad to compete in the tournament. Over the last few years, women's rugby has seen a huge surge in numbers, both from young girls and adult women in Tullamore and all around the country. With the recent success of the Ireland's Women team in the 6 Nations over the past 5 years or so, the sport is becoming ever popular. So!! 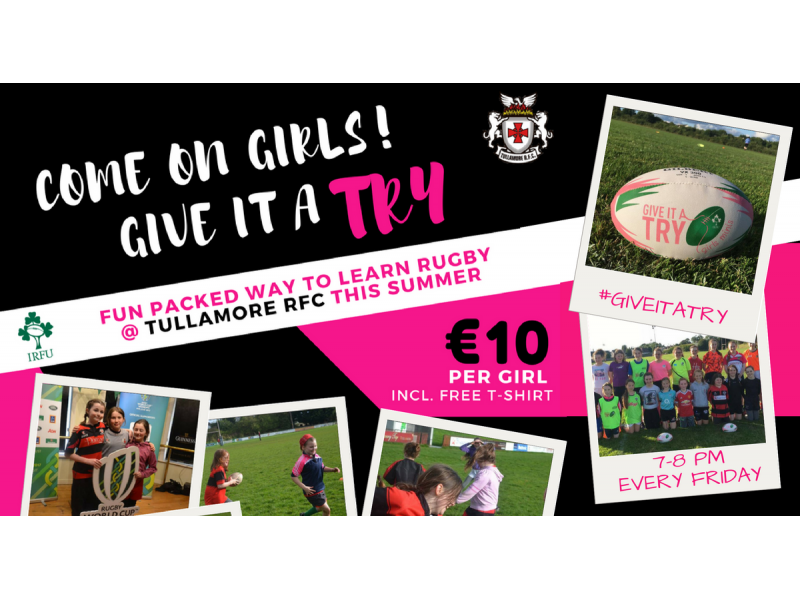 We are doing our bit here at Tullamore RFC to try and unearth the next Sophie Spence, Nicola Fryday and Niamh Briggs, by hosting six sessions for just €10, starting on Friday 7th July at 7pm at Tullamore Rugby Club (It's not too late to join us on week 2 or 3 if you didn't make the first week). As well as teaching the basics of the game, it will be a great way to stay fit and active, learn new skills, and more importantly, make new friends and share in the camaraderie that is well associated within the game of rugby. You don't have to be a club member and no previous experience is needed. At the end of the program, you will even get a 'Give it A Try' t-shirt!!! So come on down to Spollanstown from 7-8pm on Friday and take your first steps towards what we hope will be a long future in Women's rugby. Last week's intro session was jam packed full of fun games and drills, with lots of new friendships made.